This morning I woke up to a text from my mother which simply read “Fidel Castro died at the age of 90″. 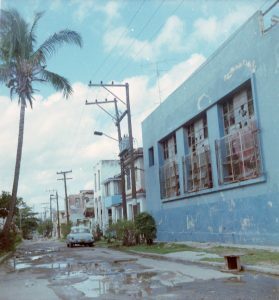 As a Latin family, the Cuban leader often came up in conversation whether in relation to the lives of Cuban friends or in political arguments over his government. My own awareness of Fidel and Cuba started in college during the late ’90s when I took a Latin American sociology course during my senior year. The course was intended to be a trial run for an exchange program between my college and the University of Havana. During the first half of the semester we studied Cuban politics beginning with the Cuban War of Independence (1895-98) and on through Castro’s Revolution. 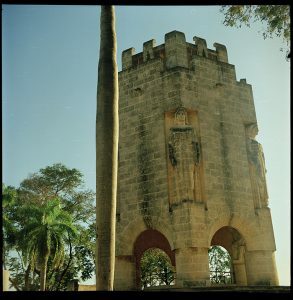 Each student also studied independently focusing on different topics in Cuban history. 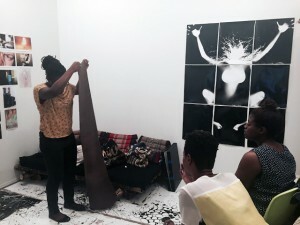 I chose to study Afro-Cuban social movements from slavery to the post-revolutionary period and did in-depth research on the Partido Independiente de Color, the only black Cuban political party created in 1908 specifically to fight racism and encourage Afro-Cuban participation in politics. In the second half of the semester we all traveled to Cuba for a 2-week journey that would take us to Havana and the eastern province of Oriente. 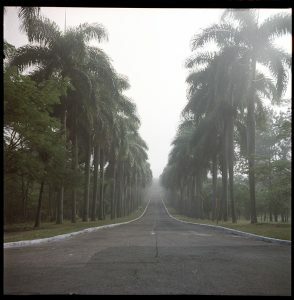 I took a 35mm camera and shot some medium format images with my vintage Yashicamat LM which I was still learning to use. 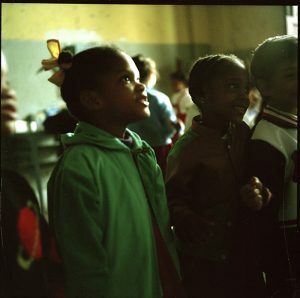 We never met Fidel, but we did meet Cubans of all ages: the elderly who lived during the Batista regime and saw Fidel’s revolution, the middle aged who had grown up during the revolutionary years and the post-embargo youth who admired North American culture and wanted a taste of its “freedom”. 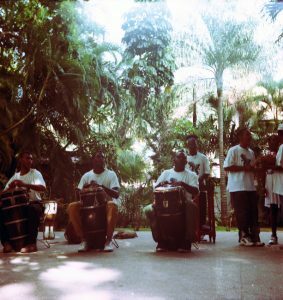 Our experiences on the island ranged from meeting with government officials to artists, students, medical professionals and farm workers. I was officially there for scholarly research so I was more occupied with listening and note taking versus observing with my camera, but I was able to steal a few quiet moments to shoot. 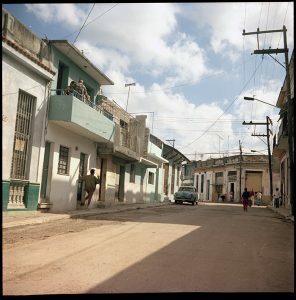 Below are some of the medium format images I shot in Cuba during that 1999 trip, which I also shared this year on my Instagram. 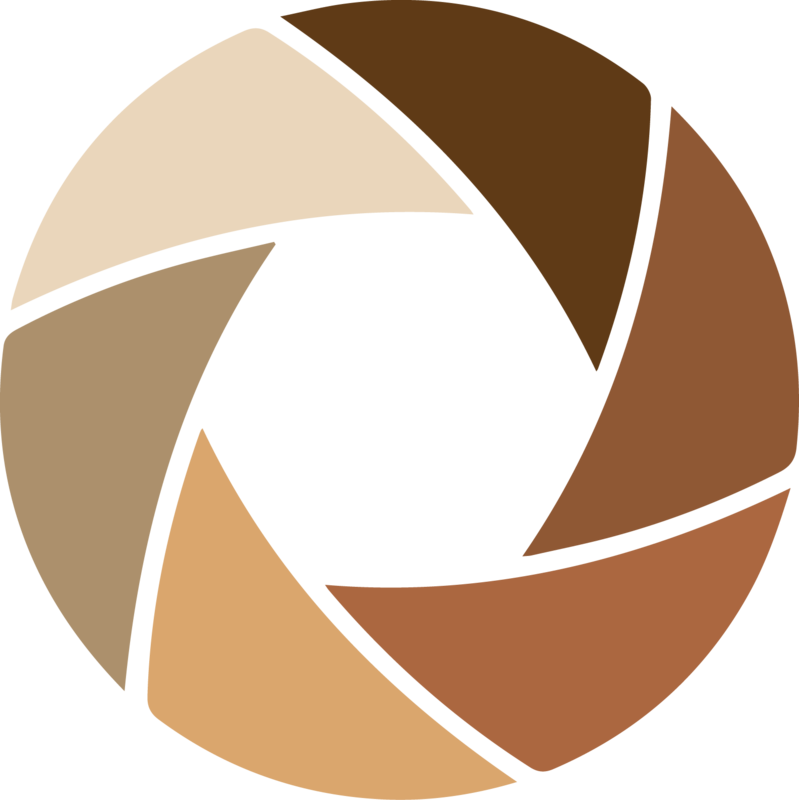 I did shoot other 35mm B&W and color images that I would love to revisit and perhaps self publish into a small book with some of my writings and recollections. 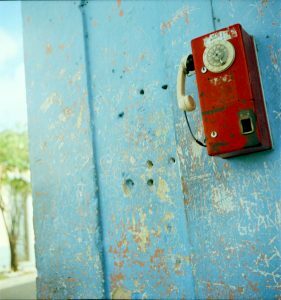 I’ve never been back and I’m sure if and when I return, Cuba will be a very different island from what I saw that year. 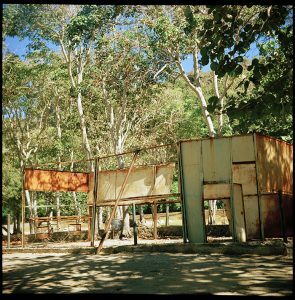 An abandoned structure on Siboney Beach, Oriente, the site of the landing of American troops during the Spanish-American War of 1898. 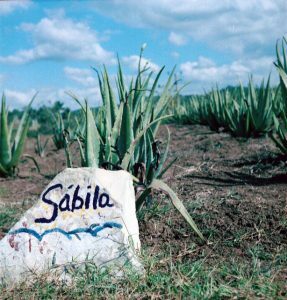 The Oriente countryside is as lush and green as any Caribbean landscape… here’s an image from an aloe (sabila in Spanish) field within a farm that we visited. 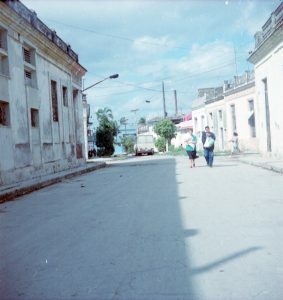 A street scene in Oriente, Cuba. 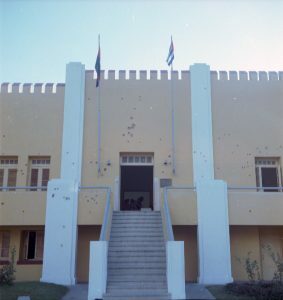 The Moncada Barracks in Santiago de Cuba, Oriente. 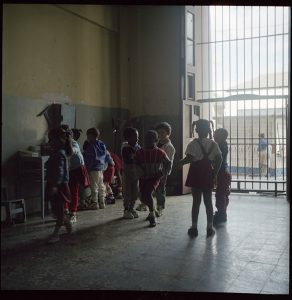 On July 26, 1953, the barracks was the site of an armed attack by a small group of revolutionaries led by Fidel Castro. This armed attack is widely accepted as the beginning of the Cuban Revolution. The fortress was converted to a school in 1960 and later became the he 26 of July Historical Museum. 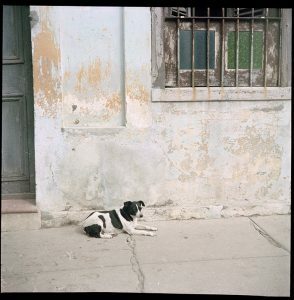 A stray dog in Oriente, Cuba. Honestly the only homeless population I saw on the streets Cuba during the entire trip were stray dogs. 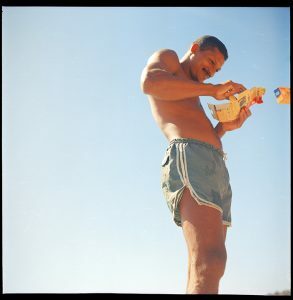 This young Cuban man was intrigued by us as we were the only others on Siboney beach with him. Here he is pretending to read my film box. 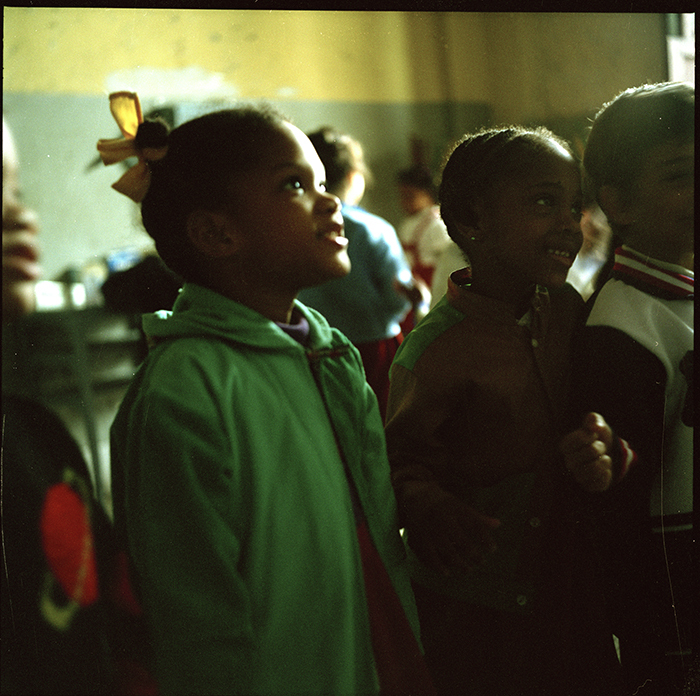 Cuban schoolchildren gather around us during a visit to Oriente province. 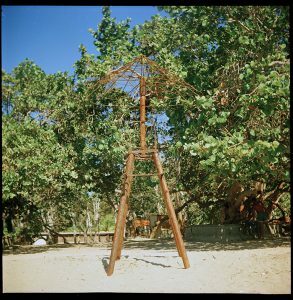 An abandoned lifeguard tower becomes natural sculpture on Siboney Beach, Oriente, the site of the landing of American troops during the Spanish-American War of 1898. 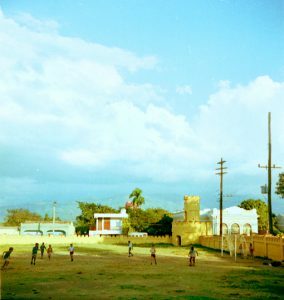 Soccer field in front of The Moncada Barracks in Santiago de Cuba, Oriente. Road to the Second Front memorial, a place of honor reserved for the fighters of the Cuban revolution (1953-59) which eventually toppled the dictatorship of Fulgencio Batista.